The first thing we would like you to know is that you and your family/whānau will be very welcome at your chosen Southern Cross hospital. If you are planning for a procedure or surgery* we hope the information provided here will be useful. If you already have your procedure booked, the following website pages provide you with important information about what you need to know and do during the stages of your procedure. This section is to help patients prepare for their hospital visit. Most patients will receive a Southern Cross Hospitals Patient Admission Pack (admission pack) prior to their hospital visit - which includes the information provided here. Your hospital needs to receive all 3 completed forms at least one week prior to your admission. Please take mailing time into account. If your procedure will temporarily affect your mobility. If so, you may need to make arrangements for when you return home (such as crutches, someone to drive you, meals and sleeping arrangements). Depending on who is funding your treatment, you may be required to settle outstanding accounts or make co-payments prior to leaving the hospital. If your treatment is covered by insurance, you will need to forward all final costs to your insurer (this will be broken down into separate accounts from the hospital, your surgeon and your anaesthetist). We encourage parents and carers to stay with their children in hospital. Please contact the hospital regarding availability of space and associated charges should you want to stay overnight. You may like to visit the hospital before admission to familiarise your child with the surroundings. We recommend you bring a favourite toy and any special items that assist in comforting your child, and that you do not bring other children with you to the hospital. If this is not possible, you will need to arrange for another adult to be present to supervise the other children. I am well (no colds, cough, diarrhoea, vomiting). I do not have any cuts, scrapes or wounds and I have no current infections. I have not undertaken any recent long distance flights. If you have any symptoms or are unsure, please consult your surgeon prior to coming in to the hospital. We are mindful that your procedure requires you and your family/whānau to interact with many health practitioners, and that the terms used in documents can make it easy to lose track of who is who. Here is an explanation of who we mean by the terms used in this website. The doctor performing your procedure. Surgeons are often also referred to as ‘specialists’, ‘physicians’ or ‘consultants’. The doctor who works with the surgeon and provides anaesthesia. The Southern Cross nurses who will be involved with your care. Your current family doctor (GP stands for General Practitioner). On admission to the hospital please report to the hospital main reception to begin admission and confirm payment arrangements. You will then be escorted to an area such as the ward, day-stay or an admission room, where a nurse will complete your admission and assist you to prepare for your procedure. You may discuss any questions, concerns and personal needs during this time and if you require any additional cultural, spiritual or emotional support, please advise your nurse. In consultation with your surgeon and anaesthetist, our nurses will plan your care with you. Your medical care while you are in the hospital is the responsibility of your surgeon, while your nursing care will be provided by our team of nurses. Southern Cross does not employ doctors at its hospitals, but we expect your surgeon to visit regularly during your stay. Should the need arise, we also expect your surgeon to be available by telephone and to attend the hospital to provide further prompt specialist assessment or additional medical treatment. In the case of a medical emergency, we will call your surgeon and you may be transferred to an emergency, coronary or intensive care service. During your treatment, some commonly used medications may not have been submitted for Medsafe NZ’s approval; these are called Section 29 Medications. Where your health practitioner prescribes a Section 29 Medication for your care, we are required to provide Medsafe with your name and your prescriber’s name. Ward or day-stay areas at our hospitals are designed to comfortably meet your needs. Facilities for patients who stay overnight include an ensuite bathroom, telephone, WiFi, television and radio in an individual or shared room. Please note, charges may apply to telephone calls. The daily newspaper is available on request. Our meals have been designed to be appetising, nourishing and meet your specified dietary requirements. Patient comfort: Visitors are typically welcome during the day and early evening. Rest periods may apply for patients who have had major surgery. We aim to ensure a restful and private environment for everyone. Some facilities have garden areas available to patients and visitors. On most occasions, we encourage a parent or carer to be with their child as the anaesthetic is started. Please discuss this with your anaesthetist and surgeon. If you are unable to do so, a nurse will stay with your child during this time. We reunite parents or carers with children as soon as is practicable after procedures. As part of the processes to ensure your safe care during your stay, you will be asked to confirm your name and other details several times. This starts when you arrive at reception, with your admitting nurse, and continues when you are transferred to the procedure room or operating theatre. Your surgeon, anaesthetist and nurses will also take a short ‘time out’ to complete a final check immediately before your procedure begins. To ensure a physically safe environment for all patients and health practitioners, we have eliminated all possible manual lifting by using mechanical aids as well as safe positioning and holding methods. The Patient Health Questionnaire includes questions relating to your physical status to help us plan your care. Southern Cross hospitals are smoke-free in accordance with the Smoke-free Environments Act. Southern Cross is committed to delivering your care in accordance with the Code of the Health and Disability Services Consumers’ Rights. Your privacy is important to us. Please review the privacy statement at the bottom of the forms to fill out sheet included in your information pack. Your surgeon and nurses will discuss with you arrangements for your discharge from hospital. If you have any concerns regarding your discharge or you require assistance, please raise it with them. If you have stayed overnight or longer, discharge time is by 10am. Charges may apply if you decide to extend your stay after your surgeon has discharged you. I have arranged for any necessary rehabilitation aids (e.g. crutches). Please note: At the time of your discharge, your nurse will provide you with additional discharge information and will help you to complete your post-operative recovery plan in the Blood clots and YOU brochure. Any other signs, symptoms or issues that are of concern to you or your family/whānau. If in doubt, or in the event of an emergency, call an ambulance immediately (111). Wash your hands - one of the best ways to stop the spread of infectious germs is to wash or decontaminate your hands. This is referred to as hand hygiene (or hand washing). Please take the time to read the ‘Hand Hygiene for Consumers’ leaflet in your admission pack. You can download a copy here. And you can see how best to wash your hands here. Keep warm – wearing warm clothes to the hospital, keeping warm in cold weather (including heating the car before you get in), and keeping warm before surgery can help to lower your chance of getting an infection. Stop smoking – smoking can have an impact on the body’s healing process. It can also cause damage to your airways, making an infection more likely. Stopping smoking before you are admitted to the hospital can be helpful in reducing your risk. Maintain a healthy weight – people who are overweight are at greater risk of infection. We recommend you talk to your doctor about how to achieve and maintain a healthy weight. Make sure your healthcare team is aware of any medical conditions – this includes existing conditions, any medications you are taking that might lower your immunity (some examples include immune suppressants, chemotherapy or steroids), or if you already have drug-resistant bacteria. Let your doctor know if you have recently been unwell before you come to hospital – being unwell before you are admitted to the hospital can lead to further illness. Let your doctor know before you come to the hospital if you are not well or have been recently unwell. Ask your family/whànau and friends to stay away if they are unwell. Do not shave the surgical site. If hair needs removing, this will be done in the hospital. Let us know if you have been in a hospital overseas in the last 12 months. For information on the Hand Hygiene NZ (HHNZ) programme and view the national HHNZ audit reports see the HHNZ website. A blood clot that forms in a deep vein in the muscles of the leg is known as a deep vein thrombosis or DVT. The clot can partially or totally block blood flow. Most blood clots form in a vein in the calf. They are less common in the thigh, and rare in other parts of the body. Venous thromboembolism, or VTE, describes the whole process by which clots form and travel through the blood stream. ‘Venous’ means to do with the veins. This is different from arterial thrombosis which can cause a stroke or heart attack. When a blood clot forms in a leg vein, it is called a Deep Vein Thrombosis or DVT. It usually remains stuck to the vein wall. 1. Part of the blood clot may break off and travel in the blood to the lungs. Here it may block an artery and cut off blood supply. This dangerous condition is known as a pulmonary embolus, or PE. A large clot in the lung is very serious and can be life-threatening. 2. If the blood clot in the leg is not treated, it may lead to long-term symptoms such as pain or discomfort, swelling, rashes or – in severe cases – a skin ulcer. This is called post-thrombotic syndrome. It happens because the vein is blocked, and can therefore damage the leg tissues. To help you assess your personal risk of suffering from VTE, your admitting surgeon or physician will provide you with a “Blood clots and YOU” brochure, along with your patient admission pack. The brochure (see Additional Resources section on this page and refer to 'Signs I should watch for') contains a self-assessment checklist and a post-operative recovery plan which you can use to self-assess your risk of VTE. You can then design a personal plan to follow after your surgery. This will help reduce your risk of suffering from post-operative VTE. Please note: This website is for information purposes only and does not constitute medical advice. Please consult the doctors caring for you for such advice. There are a number of ways to reduce your risk and your health practitioner/s will work with you to plan the best options for you. We recommend you talk to your surgeon or physician about your personalised blood clot prevention plan. Adequate water intake helps blood stay fluid for good blood flow. Reduced water intake could thicken the blood. The UK’s National Institute of Clinical Excellence (NICE) recommends proper hydration as a key recovery step for mitigating the blood clot risk of patients who have undergone any hospital procedure . Ensuring that your body is properly hydrated whilst recovering from a surgical procedure greatly reduces your chances of developing a blood clot . As a general guide, if you drink less than 4 glasses of water a day, if you are going to the toilet less than four times a day or if the colour of your urine is dark yellow, you may be dehydrated. However, you should note that drinking too much water can flush essential electrolytes from your body. If you are unsure about how much water to drink, please consult your doctor. Frequent light activity (e.g. getting up, walking around and leg exercises) helps to move blood around the legs, reducing the risk of blood sitting and clotting in the veins. 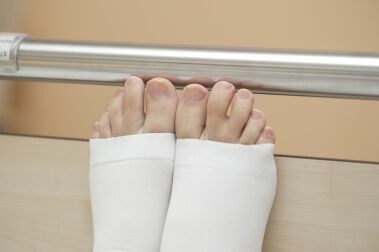 Although it is important to rest while recovering from surgery, mobility helps your blood to circulate, reducing its chances of pooling in your legs or lower body. Sluggish blood is more likely to be associated with a deep vein thrombus. Medical experts and the National Stroke Foundation of Australia recommend early post-operative mobilisation of surgical patients to reduce their risk of suffering from VTE [3,4]. Undertake reasonable amounts of activity as advised by your doctor or nurse. Useful activities include leg exercises which you get taught in hospital and general walking. Your doctor and nurse will give you details of distances and frequency of exercise, as well as how to increase your exercise regime. This will be individualised according to your level of general fitness and health, the procedure you have had and your recovery response. Compression stockings squeeze the legs, reducing the diameter of the veins and improving blood flow. Immobile blood is much more likely to clot, and current medical research has directly linked the use of graduated compression stockings with a decrease in the risk of DVT among surgical patients . Need to be worn at all times; including while in bed. It is recommended that patients obtain two pairs of stockings so there is ample time for laundering and careful drying whilst continuing to wear a pair for VTE protection. Require specific laundering and drying. Please follow the supplier’s or manufacturer’s instructions for the care of your compression hosiery. Click here to access the T.E.D TM Anti-Embolism Stockings Patient Guide (2013) from Covidien. This resource provides detailed information regarding the proper use and care of your compression hosiery. Anti-clotting medicines work by reducing the blood’s tendency to clot. This may also increase the risk of bleeding.The aim is to get the dose just right so the blood will not clot too easily, and bleeding is less likely. Some people cannot take anti-clotting medicines if they already have a condition that makes them bleed more easily than normal. Some anti-clotting medicines can be injected just under the skin. Others are taken as a tablet. You may be given an anti-clotting medicine for a few days or up to a few weeks, depending on your particular operation or medical condition. Check with your medical team about how long you’ll need to take your medicine for. Please make sure that you understand your blood thinning medication plan before and after you leave hospital and take your medication/s strictly as directed. If you do have any concerns, contact your treating health practitioner. Intermittent pneumatic compression (IPC) involves a garment around the leg that is regularly inflated and deflated, to squeeze the leg. It may be over the whole leg or just the calf. Venous foot pumps have a pad under the foot that is rapidly inflated and deflated every few seconds. This stimulates blood flow in the sole of the foot. The pad is held in place by a slipper. Please refer to your Southern Cross Hospitals "Blood clots and YOU" brochure (see Additional Resources below). If you consider your self-assessed risk of VTE to be higher than you expected, please inform your doctor immediately. We conducted consumer research to discover how best to enable blood clots risk awareness and provided a tool (the Blood clots and YOU brochure, provided in your Admission Pack) for patients to care for themselves. You may wish to request an indication of the costs of your procedure. First, please ask your specialist about the expected cost (specialist and anaesthetist fees) and also the expected time in theatre (where applicable) and the length of your stay in hospital (e.g. day stay or overnight). We can then provide you with an indication of the hospital charges that may apply to your visit, based on our experience. We are only able to provide you with an indication of your surgery costs at this time. The actual cost will not be known until after your surgery has been completed and your account is made up at the time of your discharge. If your treatment is covered by insurance: You must bring your prior approval confirmation letter (if supplied) with you to the hospital. Please ensure you understand what amount your insurer will be covering, as some insurance policies require a co-payment or excess payment. Please note that the hospital does not usually submit insurance claims directly to insurers (this includes Southern Cross health insurance). If your treatment is through the Southern Cross affiliated provider scheme: You should receive information about any potential co-payments required before you come into the hospital. If you are unsure about what you might have to pay, please contact Southern Cross health insurance directly. If your treatment is covered by ACC: The hospital will seek approval for your procedure on your behalf. If your procedure is only partially funded by ACC, you may be required to pay a deposit on admission. If you are paying for all of the costs directly: You may need to pay the estimated cost of your hospital account on or before admission. We accept pre-cleared credit cards, bank cheques and cash on the day of admission. Alternatively, you may pay by personal cheque or direct credit to our nominated bank account 5 days prior to admission.The balance of your hospital account must be settled on discharge. Advanced payments, invoice payments, co-payments or excess payments can be made using a credit card (VISA or Mastercard) on this website. Please note: Ensure that you check at Reception before you leave the hospital. You will be able to settle your account where this is required and the administration team can complete your discharge. Contact your hospital if you have any questions relating to payment arrangements, including a price indication from your chosen Southern Cross hospital. Each medical practitioner (including your surgeon, your anaesthetist, your GP, and others such as physiotherapists) is independent of Southern Cross Hospitals and will have a separate account for you or your insurer. You may wish to seek price indications from each practitioner. Is it OK to continue smoking cigarettes and drinking alcohol the day before my surgery? Answer: We recommend that you avoid alcohol, cigarettes and non-prescribed medications or substances (other than your prescribed medications) for at least 24 hours prior to your admission. You may wish to consider using nicotine replacement prior to, during and after your hospital stay. Please talk to your specialist about this before your admission. See Medication FAQs (below) for more information. What if my health has changed or I have a cold or skin infection? Answer: If there have been any recent changes in your health, please advise your anaesthetist, surgeon or Southern Cross Hospitals nursing staff at the earliest opportunity. For example, if you develop a cold, infection or flu, have a skin infection, scratch or sore, vomiting or diarrhea, or suffer from an asthma attack prior to your admission, you should let your specialist or the hospital know as soon as possible - as it may be necessary to postpone your procedure. When should I stop eating and drinking? Answer: If you are undergoing surgery, your stomach must be empty and therefore it is very important to ask your specialist when you should stop eating and drinking (this includes chewing gum and sweets) before admission. It can be very dangerous to eat or drink before your procedure as it can cause you to vomit while you are under anaesthesia and it is possible you will inhale the vomit into your lungs, causing damage and affecting your breathing. Here are some general guidelines, but you will receive specific instructions from your specialist, as individual requirements may differ. Adults and children over 2 years: Do not eat anything for 6 hours before your admission time. You may drink WATER freely up until 2 hours before your admission, then nothing more. Children under 2 years: Cows milk or formula may be taken up to 6 hours prior to admission time and breast milk up to 4 hours before admission. Water only up until 2 hours prior to admission and then nothing more. Can I leave my MedicAlert bracelet or pendant on? Answer: Yes, it is very important that you leave your MedicAlert bracelet, pendant or other MedicAlert item on at all times. It is also important that you indicate that you have a MedicAlert or any other allergy or sensitivity on your Health Questionnaire Form and verbally on admission to your medical specialists and nurses. Do I bring my usual medications in with me? Answer: You should discuss with your specialist any regular medications you are taking. It is important that you bring all your usual medications and other remedies in the original containers to hospital with you - as well as a printout of your medications from your GP or pharmacy/chemist that includes the dosage and how often you take them. A detailed list from your general practitioner will help your doctors ensure the correct medications are continued for you. Medicines include tablets/pills, syrups, ointments, inhalers, injections, herbal remedies, homeopathic and complementary medicines, vitamins and other supplements. Should I tell my specialist if I take natural supplements, herbal, homeopathic or other medicines not prescribed by my GP or specialist? Answer: Yes, always tell your anaesthetist, specialist and/or registered nurse about any vitamins, herbal remedies, homeopathic medications or supplements that you are taking, as these may interfere with conventional drugs and anaesthetics. As a rule of thumb, do not take non-prescribed medications or substances for a week before surgery unless your anaesthetist or specialist has specifically stated that you can. Please refer to Your Anaesthetic leaflet, produced by New Zealand Society of Anaesthetists - a copy of which is included in your Admission Pack. Should I keep taking my usual medications? Answer: If you are being admitted on the day of your surgery, yes, continue to take your regular medications as prescribed - unless advised otherwise by your specialist. Patients on anticoagulants need to take special care. Anticoagulants (blood thinning medications) e.g. Warfarin, Plavix, Persantin, should not be taken prior to surgery without consulting your specialist. Aspirin or Disprin may be discontinued in the week prior to surgery or your specialist may request you continue to take it. Please check with your specialist about whether you should continue with any medications, including aspirin or dispirin. Can I bring my child in for a visit prior to their surgery date? Answer: We encourage you to do this but please phone the hospital in advance to organise a convenient time for a visit. Do I need to bring food for my child? Answer: We provide food designed specially for children but if you would like to bring some special snacks you are welcome to do so, remembering that this is not to be given to your child until nursing staff have given the OK.
Will my meals meet my special dietary requirements? Answer: Yes – please inform us of any special requirement on the Health Questionnaire form in your admission pack and when you arrive at the hospital. As long as your surgery allows, your dietary requirements will be met. Will the hospital or my surgeon phone my next of kin contact person when I have had my procedure? Answer: Your surgeon may contact your next of kin; however your next of kin is welcome to phone the hospital at any time for an update. Can I take my body tissue that has been removed home with me? Answer: Where this is possible yes, every effort is made to return body tissue where this is requested. Please document your request on the Health Questionnaire form in your admission pack and let the nursing staff know of your wishes on admission. In some cases the tissue needs to be analysed and will go to the laboratory immediately following your surgery. You will be informed if this is the case and advised about how you can make arrangements to pick it up from the laboratory. Answer: To ensure the safety of others and yourself, NZ Law prohibits driving following anaesthesia or after taking other medications known to impair a person’s ability to drive. Please arrange for a relative or friend to take you home, or use a taxi (we recommend that you do not use public transport). Do I need to see my specialist again? Answer: In most cases you will need to make a follow-up appointment with your specialist if an appointment has not already been arranged for you by our staff. This is usually done by phoning your specialist within a day or so of leaving the hospital. If you have any problems before that appointment please contact your specialist or general practitioner immediately. Answer: You should arrange for a responsible adult to stay with you for 24 hours after you get home. We recommend that during that time you should rest, avoid alcohol, cigarettes and non-prescribed medications or substances (other than those prescribed by your doctor) and follow the instructions of your doctor and/or hospital staff. In the first 24 hours following surgery you should not drive a vehicle or operate any machinery. You are also advised not to make any important decisions or sign any legal documents. I have not received a Patient Admission Pack from my surgeon? Answer: Please contact your surgeon’s rooms and request one. When should I complete the forms in the Patient Admission Pack? Answer: Please allow enough time for all completed forms to reach the hospital at least one week before your admission. Please take mailing time into account. Once the decision has been made for you to have surgery or a procedure at Southern Cross Hospital, you will be given a Patient Admission Pack. This pack includes admission information and hospital “Forms to fill out” that require completion prior to your first visit. Please also list your current medications, any special dietary requirements, any food preferences, and any special needs you may have on your admission form and we will endeavour to meet your requirements. To email one of our hospitals, simply select the Southern Cross hospital required. For more contact information and links to our hospital pages, please click here. If you are trying to reach us urgently, please contact the hospital concerned directly.